The EQuIS Professional Import GUI is shown below. EQuIS Data Processor (EDP) is the import tool used to check and import data into EQuIS Professional, using EDDs. The user can open up EDP Express by holding shift and clicking on the EDP button under import. 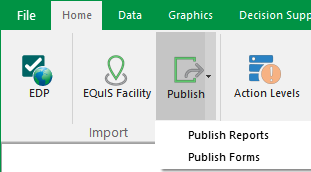 The EQuIS Migration Wizard tool allows the user to connect to a database, create a new facility, and import reference values and/or data tables to the new facility. Publish options allow the user to publish reports or forms to the database.